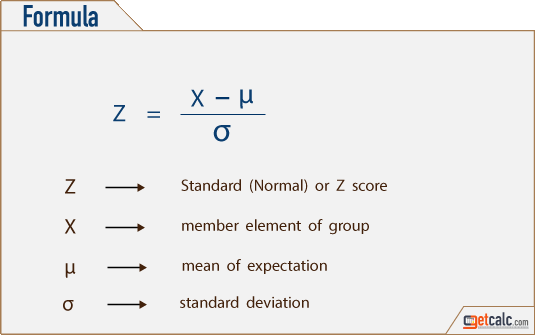 getcalc.com's Standard Normal Variate (Z-score) calculator to measure how much standard deviation, a member X in a distribution or population deviates from its mean or to find what are all the well or under performing members in a group or distribution in statistical experiments. Users can also use this Z-score calculator to generate complete work to learn how to find normalized score of a member of distribution or solve grade school students's standard (Z) score worksheet problems. The below are some of the example calculations with work that generated by this normalized score calculator. What is Z-score & its Purpose? Z-score is well known by other names as standard normal variate, standard score, normalized score or normal score is a numerical value which represents how many standard deviation a member X in a distribution or population deviates from its mean in statistical surveys or experiments. The normalized score which tells how an individual member or element X of a population close to the mean (μ) or common behavior of the distribution. The standard normal variate score generally used to identify the well and under-performing members of a population. The higher or lower normalized score represents the higher or lower deviation of a member from its population mean or central location of the data distribution respectively. The lower Z-scores of each members of population collectively improves the standard deviation of the distribution and so the uncertainty of expected results become low. Users may use this Z-score calculator to find each individual members deviation from mean of distribution which involved in the statistical surveys or experiments. The below formula is the mathematical represenation for standard normal variate or Z-score to find the deviation of a member from its population mean or common behavior of the distribution. Find the mean and standard deviation of the distribution and apply the values in the below Z-score formula to find normalized value of a member of population.